You've just accepted a new job working as an accountant in San Rafael, California. After a few months, you've finally settled in, spending most of your days crunching numbers and analyzing budgets. Exactly what you signed up for. Then, one day, you're suddenly called into another room and find yourself seated behind a microphone. You hear a friendly voice behind you: "You're like a wild animal, like a wolf, and you're eating this prey. And as you're eating--you're eating really ferociously--zombies are coming up to you and you're fending them away." That voice belonged to Lazar Levine, lead sound designer for Telltale Game's The Walking Dead. He and Jack Fusting, another key member of the sound team, can be seen multiple times during the credit roll at the end of each episode, but one credit tends to stand out among the rest: Zombie Vocal Direction. It's not a job title that you see very often, and that's why The Escapist knew we had to get them on the phone and teach us how to train everyday office workers to be the flesh-craving undead. Episode One was the first time either of sound guru had been asked to create the famous zombie "voice" heard throughout the game. 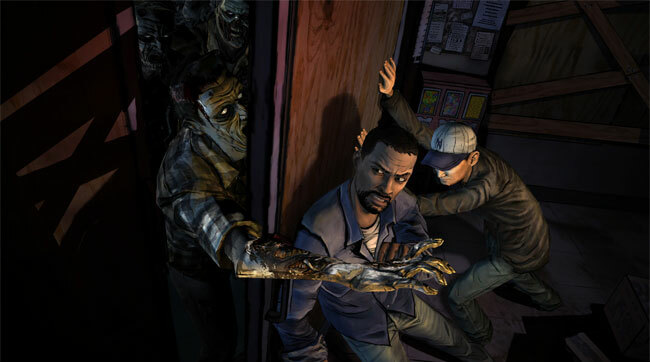 Without any practical experience in generating undead sound libraries, Levine and Fusting decided to call more than thirty people from around the Telltale office into the sound booth, and get to work culling them down into a workable, unified zombie effect. "A lot of the direction was steering people away from stuff," Fusting said. "A lot of people would go into 'gremlin territory' or kind of like 'monster territory' and we'd have to dial them back from a certain area, or ask them to tone down a certain aspect of their delivery." In the end, the team found that people who were able to make the most "throaty" noises sounded the best, and tried to work most with those who fit the new mold they'd finally discovered. "Some people came in and just nailed it from the first thing that came out of their mouths," Fusting said. "Lazar and I would just look at each other and just smile and nod. Some people took a lot of coercing." While some of the final effects came from employees who miraculously found themselves with a bizarre natural talent for impersonating decaying gas station attendants, others came by complete accident, such as in the case of a fifty-year-old human resources rep who, as Levine describes, "had never done anything like this." Fusting starts the story. (7:44) "She was the sweetest lady in the world," he said, followed by a quick, "Really like your mom," from Levine. If you've played the game (and if you haven't, a minor spoiler here) there's a scene where you're attacked by young babysitter toward the beginning of Episode One. She's as rotting and nasty as you'd expect, with a jaw that's barely hanging on to the rest of her. The game's protagonist, Lee, ends up defending himself with a hammer. "We were feeding [the lady] a Snickers at one point, trying to get her voice all mucky," Levine said. "We wanted her to eat the Snickers and then do a take - she was eating the Snickers while doing takes." He laughs as he remembers the scene. "But it ended up working out really well," he finishes, "because when you smash the zombie's face in, and you come back up, she makes this really weird noise ... and that's her choking on the candy bars." And he's right, it sounds amazing. But what about the rest of us, those who aren't fortunate enough to have a candy bar handy? I asked Levine and Fusting if they'd give me a glimpse at what it's like sitting down for them as one of their improvised actors. (9:52) Levine told me that he usually begins by trying to collect what he calls "attack noises," followed by running through a bunch of other categories, such as feeling vicious, running toward victims, and acting agitated. I take a moment, channel my inner zombie and let out a moan. "Alright, that's cool," Levine says, clearly his friendly way of telling me that it was terrible--which is completely fair. (10:34) "But try to go a little less strangley, and try to clench your throat a little bit more. Yell like this." Levine let's out a quick zombie noise, and I try again. "More air," Fusting adds helpfully. "More force." "Stay away from the gremlin territory," Lazar warns. "And make sure there is a lot of forced air coming up through your throat, and stay in the human territory." I get distracted by the thought of gremlins and humans fighting over geographical boundaries and forget the rest of my training. (11:30) The next attempt sounds like I'm auditioning to play a B-movie Frankenstein monster, and won't be getting a callback. But, Levine is a pro, and keeps his cool. He tells me to "cut the difference in half." I cut it in half. "Remember the force," Fusting says. I suddenly wonder if this is what Luke felt like when Obi-Wan blindfolded him during Jedi training. Levine decides on a final approach. "Instead of trying to make vocals," he says, "just force air out through your mouth." He makes a walker noise straight out of the game. (11:46) His flawless example is nothing short of intimidating. It's becoming increasingly clear why he's trusted to train zombies for a living. There's no way I'll match him, but I give it one last go, and Levine tells me I've gotten way better. (12:03) Jack even claims it's pretty damn good. They're probably just being nice, but I ask if I have a future in professional zombie voice acting anyway. They agree to pay me in king-size Snickers bars. Seems a fair shake. Anxious to get the spotlight off my questionable voice acting skills, I hit Levine and Fusting with a hardball: In the event of an actual zombie apocalypse, do you think that the people you've trained would have a better shot at surviving? "You'd sound pretty cool," he offers. "And you'd definitely feel like you'd fit in ... maybe." Then, he thinks for a moment, and finally admits that he and Fusting have actually been making it worse for the people nice enough to act for them. "Actually," he says, "you'd probably scare people that might help you. It would probably be a detriment, honestly." Levine and Fusting's admittedly questionable impact on the impending zombie apocalypse aside, their work on The Walking Dead in the meantime has been nothing short of superb. Any game whose description will always have some form of the word "zombie" first sentence will always rely heavily on its undead being convincing and menacing. They've got to be real. The intricacies of sound design will always be something people take for granted when playing a game. But if you're one of them, don't feel bad. It simply means that artists like Levine and Fusting have done their job; they've convinced you that a sweet fifty-year-old woman chewing on a candy bar is out for your brains. And that's the way it should be.